Fighting Hair Loss with Products that Work! Do you know anyone that suffers from hair loss? I seem to know a fair few from people in their 40’s to others that are older. It’s interesting to see how many products seem to have sprung up to help treat this particular condition but then the question is do they actually work? Any product that claims to show results within the course of a few short weeks is frankly a waste of time. Due to the rate that hair grows you are in for the long term and will need to use a product for 6 to 12 months to show a significant improvement although it can take less time to show an improvement. Hair grows at the rate of around 2 to 3cm per month so you need a few months – around 2-3 to notice results of any kind. Various factors can lead to hair loss from hormonal imbalances, stress, age etc. Don’t forget when you are treating hair loss unless treated holistically (treat the person as a whole) you are not treating the cause of the condition but merely its effects. Earlier this year I was sent some products to pass on to someone I know that sufferers from hair loss as I noticed they were becoming increasingly worried about it. As you can imagine hair loss can really impact peoples confidence as our appearance is the first thing anyone will notice about us. The person in question is a female who has a reasonably healthy lifestyle and is in her sixties so I would put the hair loss down to being age related and threw in reduced vitamin and mineral absorption and poorer circulation of nutrients too as the cause. 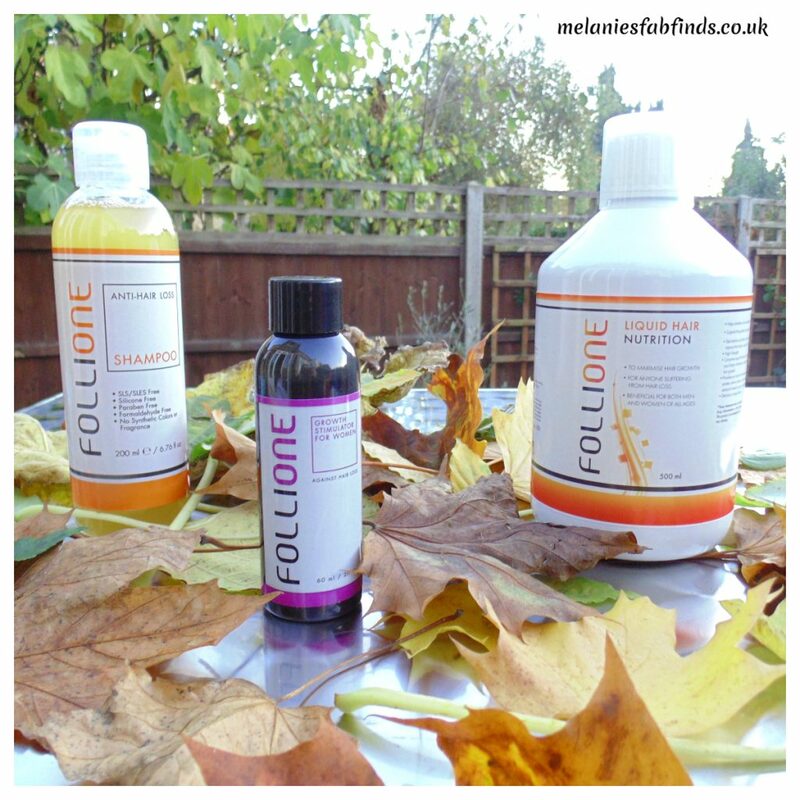 I gave my test subject 3 different products from the FolliOne range as I had done a little research into this product and saw evidence of this being a product that would yield positive results. 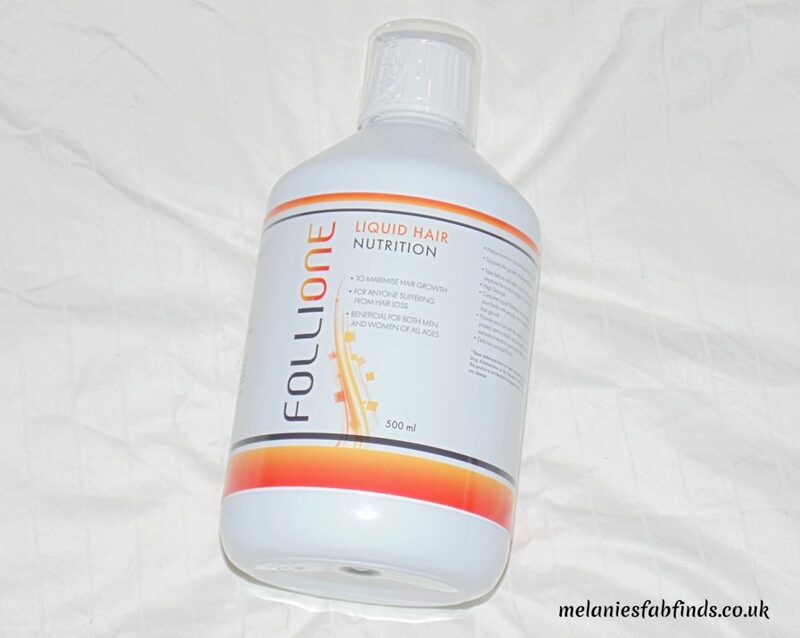 The Follione Liquid Hair Nutrition is an orange flavour daily dietary supplement that is taken daily and is full of a large range of vitamins and minerals that are specifically combined with the intention of providing the essential nutrients required to promote hair growth and to make it grow stronger and appear fuller. This can be taken as it is or added to a drink to avoid any after taste. You might find that when you pass water it is a bright yellow colour after taking this. Do not fear this is just the body removing any of the water soluble vitamins it doesn’t need after stocking up. This is a unisex product. The shampoo was designed to be used alongside the supplement and is a very runny – unlike shampoos we are used to so care needs to be taken when applying. Be aware it doesn’t lather up as much as the shampoos we are used to either but it still does work effectively. Some of you may recall I have come across another product that was similar in that it didn’t really lather but still washed the hair well. This is designed to promote hair grown and prevent hair loss. 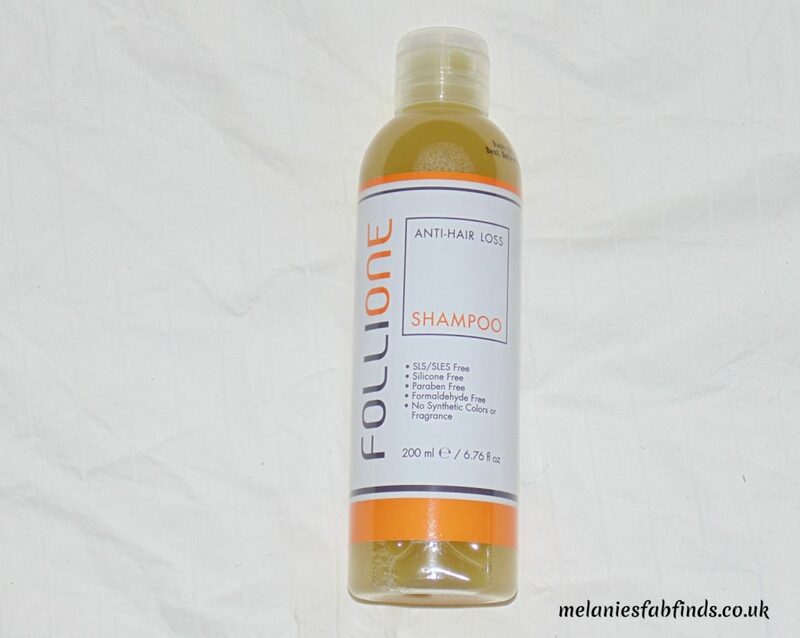 The Follione Shampoo is free from all sorts of nasties inducing silicone and parabens which of course is what we prefer not to have in our hair products don’t we. The growth stimulator for women is designed for those in the early stages of hair loss and contains clinically proven ingredients. You apply 1ml of this twice a day to the scalp. It can look like you have applied a product to the hair but then when you weigh this up with the fact that it will improve the appearance of you hair you will see it’s worth it. And in that last sentence I’ve given it away. My test subject used each of these until they finished and noticed that the hair had begun to grow back thicker and healthier. Further use may even result in further hair growth. You could see a marked improvement in the appearance of the hair with less of the scalp showing which I was really pleased about and I noticed she this had helped boost self confidence levels. I really do hope she continues with these or at least with some of them although its hard to differentiate which had the most effect as they are designed to work together. Disclaimer: I was sent a sample for my consideration. All opinions are my own!!! Please be aware that I will not include products on my blog that don’t work or that I don’t like. I don’t suffer from hair loss but know someone who does. There is some great advice and products I will need to pass it along. The great thing is I have tested this so know it does show a difference and with further use the improvement would be significant. Good thing you cleared that up on the bright yellow color,that would have scared a lot of people. Lol, yep. I thought it would be a good idea. It can help from what I saw on my test subject. I am such a huge fan of products that actually do what they say they’ll do! I’m so pleased it worked! Me too I hope she continues on with it as it did make a difference. Whilst it’s back to normal now, I suffered for quite extreme hair loss after both my pregnancies and it can be so scary when you’re in that moment! It really can and I am pleased your’ is now back to normal. It’s good to know there are products that will help.